In Part 1 we discussed how to choose a box or container. Now it is time to decide exactly HOW to store your items. 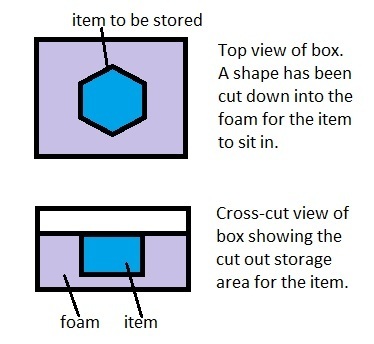 One of the basic techniques for creating safe storage for a precious item is by creating a form inside your container. Now what exactly do I mean by form? Well, if you just toss an item into a box it will rattle around. How fragile is your item? Will it shatter? Will it bend? Can it be nestled into a hole or does it have a hole in the middle that can be used to anchor it? Does it need to be secured from the top and bottom, or can you always keep the box “right side up”? The following simple diagram shows an example of what I am talking about. The bottom of the box is lined with a piece of foam, with another piece of foam glued in the center to secure the coronet or tiara in place. I make sure that this central piece of foam is as large as possible, while still allowing the item to be removed from the form. 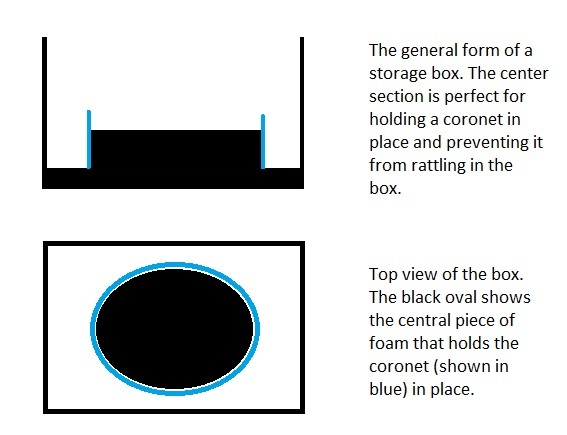 Don’t forget that you will be covering the foam with fabric – I prefer black velveteen for coronet boxes because it provides a really nice backdrop for the shiny metal and is not too slippery. While fabric like satin looks really nice, it can drive you crazy. Remember -you need to choose your level of “crazy” and go with it! I do NOT glue the bottom piece of foam into the box – I press fix it. This means that I cut the bottom piece of foam so that it will barely fit into the bottom of the box. Why a press fit? If you want to change the décor on the inside of the box, or the design of the storage container, or if the use of the box ever changes, having glued in foam will make the “change” a serious pain. You risk damaging the box, or even losing your temper! 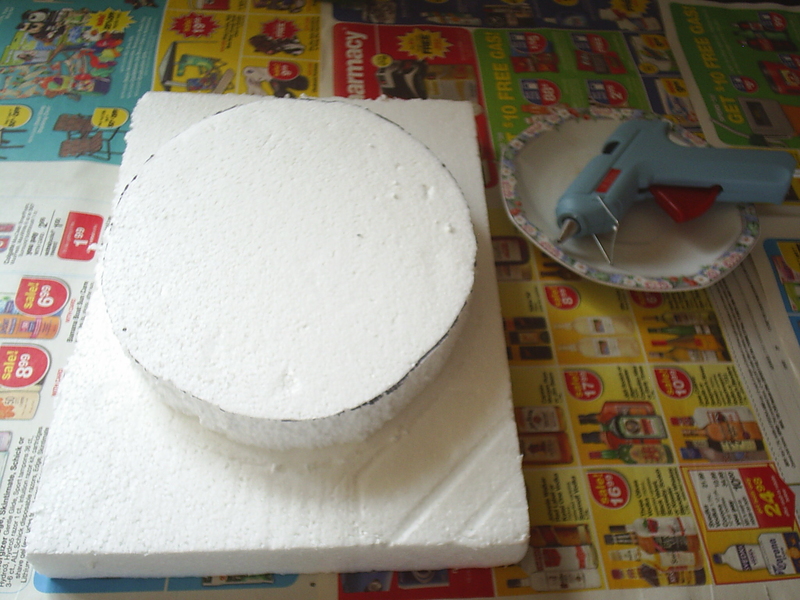 The next picture shows the foam glued together before the fabric has been put on top. Note the newspaper and plate under the glue gun. The glue will peel off the plate easily once it is cold and both the plate and newspaper protect the countertop. Formica countertops or tables can be damaged by a hot glue gun. This arrangement assumes that your piece is hollow and can be anchored by a form placed inside that hollow. Some items will require that you create a hollow inside of the box for them to nest in. This picture is an excellent example of two items that could have been stored using a central form, but instead were inset into foam rubber. This example uses a plastic pistol case. It is very functional, but NOT pretty. The case comes with three layers of foam and you customize it by cutting the foam to create a good fit for your piece. Evaluate what you need to store and figure out what the best technique is for keeping your item safe. Then pull together your supplies and start the process. A box, foam, or other padding, a hot glue gun (I use a high temp glue gun because the glue sticks better), a sharp knife and a ruler should be all that you need to get started!